Utah is home to more Dark Sky Places than any other place in the world according to the Consortium for Dark Sky Studies. Photo © Mark Johnston. The Natural History Museum of Utah's mission is to "illuminate the natural world and the place of humans within it." Every Museum exhibit, object, and outreach initiative stems from that goal. However, the new Dark Skies exhibit in NHMU's Sky Gallery invites guests to illuminate by turning out the lights. In this way, the natural world and the sky it hangs in illuminates us. Today the Milky Way is only visible to 20% of Americans according to a recent study by the Light Pollution Science and Technology Institute. It is hard—impossible really—to comprehend or quantify the value that our ability to gaze upon dark sky has had on humanity. People from every part of the world have used the night sky to make sense of themselves and of the universe. It is quite possibly our oldest tool for doing so. Yet while it may not be possible to fully understand the value of darkness, understanding the negative effects associated with its absence are. Birds’ migratory patterns, sea turtles’ ability to find water after hatching, trees’ seasonal leafing patterns, even our own human circadian rhythms—these are all impacted by light pollution and have consequences that ripple far and wide across an ecological pond. Less a single bodied conservation effort and more a multi-faceted approach to raising awareness of dark skies and studying them, CDSS operates from disciplines including biology, urban planning & ecology, economics, architecture & planning, and more. It is what founding member Dave Kieda describes as a “laboratory” for researchers to discuss all of the different issues surrounding dark skies and their increasing disappearance. 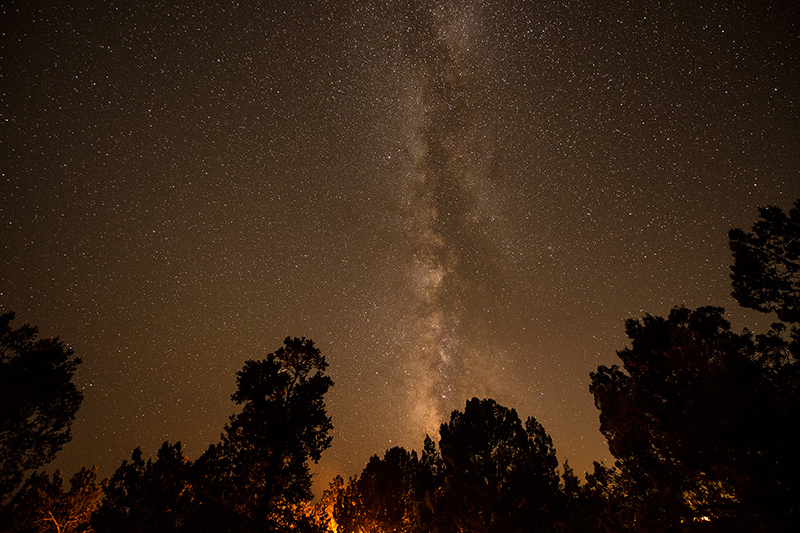 In addition to trailblazing efforts centered on the research of dark skies, CDSS also houses the Colorado Plateau Dark Sky Cooperative, a regionally based education and outreach initiative across the Colorado Plateau. The Milky Way seen from southern Utah. Photo © Mark Johnston. But the importance of dark sky preservation extends beyond protecting regional ecologies. In recent years researchers have dug into mental and physical health implications of disappearing darkness on humans. With more International Dark Sky Parks than any other place in the world, it becomes easy to see why this constellation of efforts to preserve dark skies resides in Utah. 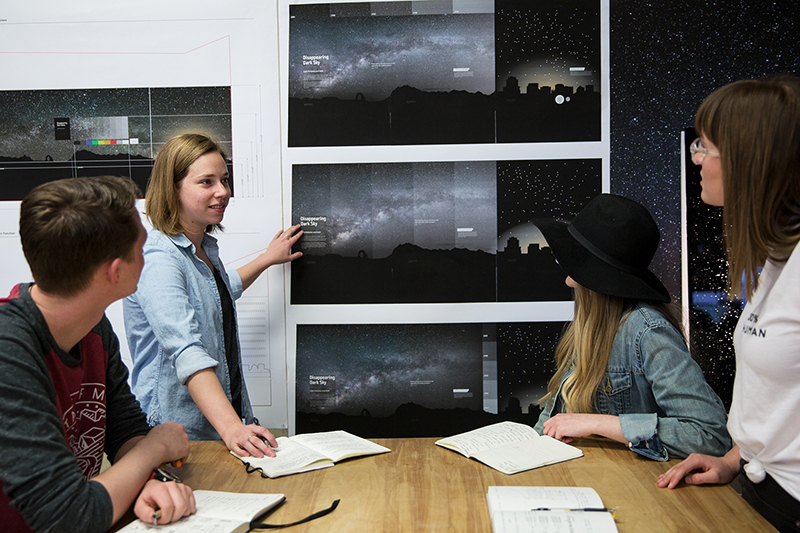 One result of this work is NHMU’s Dark Skies exhibit, which was designed by University of Utah students of the Multidisciplinary Design Program in partnership with the CDSS and NHMU. University of Utah Multidisciplinary Design Program students who designed the exhibit. Photo © NHMU. The exhibit, which was unveiled in NHMU’s Sky Gallery in April of 2018, is designed to engage guests and raise awareness of our disappearing dark skies. Wrapping some thirty feet across wall and archway, guests can view a Utah skyline and adjust the light pollution (sky glow) that emerges from Salt Lake City with the turn of a knob. When the lights are up, the city illuminates and washes the darkness above it to a nothingness of white-washed black. When the lights are dimmed, a glorious display of blue-black night sky and stars stretches above them.